Modeling behavior at a small business - hairier than you would think? No, I Don’t Shave My Legs! For years, small business owners have been told by consultants and other small business experts that their employees see everything the owner does and that as owners, we need to model the behavior we want to see. As I understood this admonition, I thought it meant such things as we should be as kind to our employees as we want our employees to be to our customers; that we should come to work ready to work, leaving our personal travails at home but also understanding that this is not always possible (yea, sorry guys, I know that I failed in this one way too often lately); that we should be willing to pitch in and help out with whatever is needed; and, that although it is work, we should make it as fun an environment as it can be. While I do think that Pet Camp is a pretty amazing place to work, that we try and respect each other and the hard work each of us does, and that we very much feel the honor and joy that comes with taking care of other people’s dogs and cats, frankly I’m not sure how much credence or focus gave this “advice.” I have to admit that I should have been paying way more attention. Much to my utter shock, I recently discovered that the counselors have been discussing whether I shave my legs! Really, who would ever have even thought that? I don’t bother shaving my face, I shave my head about once a month (if I have to brush my hair it’s too long), and I’m most comfortable in shorts and t-shirts (though years ago Virginia made me start wearing a collared shirt to work); this is NOT the guy who shaves his legs. But yes, this was the topic of conversation. Why, you might ask? Because the counselors had noticed that I don’t have any hair on the lower parts of my legs and were wondering why. If the Pet Camp counselors are noticing that, you’ve got to wonder what other small details about me, my work attitudes, how I treat and speak with them and others (stuff that I don’t give a second thought about) they’ve noticed. As weird as all this sounds (and I hope it sounds as weird to you as it did to me), this conversation was quite a reminder about the need for me to do a better job of modeling the behavior and attitudes I want to see at Pet Camp. 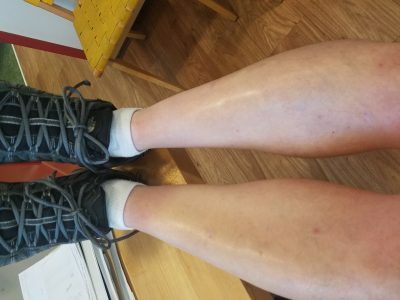 As many of you know, I’ve played a very poor game of ice hockey a few times a week for the last 10 years and the shin pads have simply worn the hair off my lower legs. Really, no shaving required. You’re always there with helpful advice! From a fellow business owners point of view, hairy legs vs. no hairy legs not important but notice you do tie nice knots with your laces and you wear clean socks. You are setting a good example in my book. YOU ARE HIRED! It would’ve been nice to turn the photo instead of making us turn our head, lol!